4/15 Cup of Coffee: There were plenty of extra-base hits to be found throughout the Red Sox minor league system as Pawtucket, Portland and Salem all slugged their way to wins. Sam Travis and Chris Marrero had big nights at the plate in a PawSox romp, while Jake Romanski led the charge for Portland. And despite racking up 12 strikeouts as a staff, Greenville's bats fell silent and could not back up a solid pitching effort. The PawSox brought the lumber on Thursday, with a 19-hit onslaught to go with a pair of home runs. Sam Travis provided one of those homers, hitting a three-run shot in the fourth inning that put the game well out of reach. He finished 2 for 5 with two runs scored and three RBI. Deven Marrero, Chris Marrero, and Chris Dominguez each drove in a pair. Chris Marrero also added a homer as part of a 4-for-5 night. Ryan LaMarre also had a four-hit night, scoring three times in the process. Seven of the nine PawSox starters had at least two hits on the night. Sean O'Sullivan picked up the win with five innings of one-run ball. He allowed four hits, struck out four, and walked one. Spotted an early eight-run lead, the Sea Dogs held off a late Hartford rally to pick up the win. Jake Romanski got things going in the first inning, driving in a pair on a single to right. He would finish with four RBI on the night, going 2 for 4. Romanski also picked off a runner at first in the second inning. Rainel Rosario had a big night out of the cleanup spot, going 3 for 4 with a pair of doubles and two runs scored. Kevin McAvoy improved to 2-0 on the young season, going 5 2/3 solid innings. He allowed two runs on three hits while striking out five and walking one. Luis Ysla was hit hard in relief, allowing three runs on three hits in 1 2/3 innings, including a two-run homer. Salem also held off a late push by its opponent to preserve a nice bounce-back win for Travis Lakins. The 21-year-old righty allowed two runs (one earned) in five innings of work. He gave up five hits, struck out four and walked only one. Yoan Moncada provided what turned out to be the game-winning hit with a two-run triple in the sixth inning. Danny Mars collected two hits, scored twice and also stole a pair of bases. Jake Drehoff shut down the Winston-Salem comeback bid in relief, striking out all four batters he faced to pick up an impressive save. It was a frustrating night for the Drive, who outhit the Fireflies 10-9. but left nine men on base, including five in scoring position. The pitching staff of Logan Boyd (three innings), Dioscar Romero (three innings), and Anyelo Leclerc (two innings) combined for a dozen strikeouts, but it all went for naught. Romero was especially impressive in relief, striking out five and giving up just one hit. Eight of the nine Drive batters had at least one hit. Luis Alexander Basabe and Luis Alejandro Basabe were the only Drive players to collect two hits. Roldani Baldwin was the only batter able to plate a run for Greenville. Player of the Night: It was a big night for journeyman minor leaguer, Chris Marrero, who collected his first four-hit night since July 3 of last year when he was in the White Sox system. 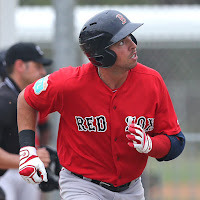 Signed by the Red Sox as a minor league free agent last August, the 27-year-old Marrero came up a triple shy of the cycle and hit his first home run of 2016. The older brother of PawSox shortstop Deven Marrero, he was last in the majors for eight games with Washington in 2013.